What do the Google Pixel 2 XL and iPhone X have in common? They’re both aiming to be the best smartphones on the market, and we’re all waiting for them to be released. The iPhone X doesn’t come out until early November, and the Pixel 2 XL was just announced. Since each is the pinnacle of what the makers of iOS and of Android can do with a phone, they embody the iOS-Android rivalry. So, now we need to see how they stand apart. While the iPhone 8 and iPhone 8 Plus were effectively hardware refreshes of last year’s iPhones, the iPhone X actually comes with an entirely new design. It adopts the reduced-bezel aesthetic that’s becoming the mark of a modern flagship. It has a redesigned metal edge, and even more glass on the back. The front of the iPhone X is nearly all screen save for a cutout at the top of the display that houses the earpiece, front-facing camera, and other sensors. The vertically oriented dual-lens camera is on the back of the iPhone X. Unlike past iPhones, there is no Home button on the iPhone X. Instead it uses facial recognition to unlock. In comparison, the Pixel 2 XL has more bezel going on, looking a little less futuristic and a lot more metallic because of its aluminum unibody. It has stereo speakers positioned at the top and bottom of the display. There’s no physical home button on the front of the Pixel 2 XL either, but it includes what Google claims is the fastest smartphone fingerprint scanner on the back. It has a single camera on each side. The Pixel 2 XL is larger than the iPhone X in every dimension. The Pixel 2 XL measures 157.9 x 76.7 x 7.9mm and weighs in at 175g. The iPhone X is just 143.6 x 70.9 x 7.7mm and a single gram lighter than the Pixel 2 XL. Both phones include similar levels of physical protection. Identical IP67 ratings for both indicate that they’re not afraid of dust and can spend up to 30 minutes in about three feet of water without taking damage. The Pixel 2 XL has Gorilla Glass 5 to resist shattering from falls onto flat surfaces, and the iPhone X has what Apple says is its strongest smartphone glass so far. Neither phone has much in terms of color options. The iPhone X comes in Space Grey and Silver, while the Pixel 2 XL comes in Just Black or Black & White. The iPhone X and Pixel 2 XL share another commonality in their lack of a 3.5mm headphone jack. Even though the Pixel 2 XL improves on the design of its predecessor, the iPhone X has an edge thanks to its reduced bezels. The competition for displays is a close one between the iPhone X and Pixel 2 XL. 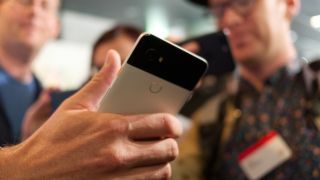 Google has packed a 6-inch P-OLED display with a resolution of 2,880 x 1,440 into the Pixel 2 XL, giving it a pixel density of 538ppi. The iPhone X display is slightly smaller, at 5.8 inches. It also has a lower resolution of 2,435 x 1,125. The pixel density is still great, at 458ppi, but it’s not as sharp as the Pixel 2 XL. Apple does have an extra perk in its screens though, with 3D Touch allowing long presses. Which display actually appears more pleasing to the eyes is a tougher matter to resolve. Both use OLED technology, but the iPhone X uses a standard AMOLED display and the Pixel 2 XL uses a P-OLED one. The difference between these isn’t likely to be noticeable, but Apple’s True Tone technology could help it stand out. On the other hand, the Pixel 2 XL is better prepared for VR, and Google Daydream support is baked in. Be on the lookout for our full reviews, which will explore just how well each screen performs in the wild. Perhaps the most distinct and hardest to compare aspects of the Pixel 2 XL and iPhone X are the hardware inside and the software they run. Each is running on the latest software. The iPhone X runs iOS 11, which is now available for some earlier iPhone models as well. The Pixel 2 XL runs Android 8.0 Oreo. Odds are that the Pixel 2 XL will run smoothly and efficiently on Android Oreo, but until we can test that in full, it’s impossible to say just how fast its octa-core Snapdragon 835 chipset will feel and how efficiently the operating system will use its 4GB of RAM. Performance of the iPhone X is a bit more clear. The iPhone 8 and iPhone 8 Plus are already out, and they run the same operating system and hexa-core A11 Bionic chipset that come in the iPhone X. The iPhone X is believed to have 3GB of RAM. The efficiency of iOS and the power of the A11 Bionic all but guarantee incredible performance on the iPhone X that will be hard for even top Android phones to beat. Both phones have virtual assistants built in. The iPhone X comes with Siri, and the Pixel 2 XL has Google Assistant. Each continues to improve, but Google’s strength in AI, search and machine learning may give it an edge over Siri that continues to grow as Google Assistant learns from more users. As a bonus, Google Assistant can be activated by squeezing the Pixel 2 XL. A killer flagship phone needs a killer camera. Google and Apple both know this. iPhones always come with an impressive camera that Android cameras try to beat. Last year, Google tried to show it was at the head of the pack by earning the highest DxOMark score for a smartphone with the camera in the Pixel and Pixel XL. The new Pixel 2 XL has a camera that scores even higher and once again sets the record for smartphone cameras. The Pixel 2 XL packs a 12.2MP rear camera with optical and electronic image stabilization and an aperture of f/1.8. While it doesn’t have a dual-lens system like much of its competition, it has Dual Pixel technology and image recognition, which enable a selective focus portrait mode like that dual-lens cameras offer. The front-facing 8MP f/2.4 camera also has this portrait mode. It’s undoubtedly going to be an impressive smartphone camera, but testing will be necessary to see just how impressive. Apple’s iPhone X also has a 12MP rear-camera, but there’s a second one paired with it. One has a wide-angle lens with an 1/1.8 aperture, and the other has a telephoto lens with an f/2.4 aperture. It also features optical image stabilization. Since it has a dual-lens system, it can accomplish the selective focus effects that the Pixel 2 XL has, but it remains to be seen which method is better. Both phones support augmented reality, but so far only the iPhone X has Apple’s impressive Animoji, which are special animated emoji that mirror the expression and movements of a user’s face. The battery competition isn’t so close. The Pixel 2 XL packs a serious 3,520mAh battery that Google says can get up to seven hours of life in just 15 minutes of charging. The numbers are not in Apple’s favor here. While the size of the iPhone X battery hasn’t been released, rumors pin it at about 2,716mAh, which doesn’t even come close to the Pixel 2 XL. It does support wireless charging, unlike the Pixel 2 XL. The price battle goes in Google’s favor. The Pixel 2 XL is still expensive at $849 for the base 64GB model, but that’s a far cry from the iPhone X’s starting price of $999 for the 64GB model. The Pixel 2 XL even comes with a free Google Home Mini for a limited time. Since both phones are new, it’s not likely that either is going to get a serious discount that would nudge one closer to a win in this category. Comparing the iPhone X and the Pixel 2 XL and naming a winner is just as hard as comparing iOS and Android. They’re two different beasts, and each has ways of beating the other depending on what they’re competing over. The iPhone X is going to be the best iPhone experience available for the next year. And, the Pixel 2 XL may very well be the best Android experience for a while (if it can actually conquer the Note 8). For anyone that’s a fan of Android, the iPhone X probably doesn’t have a compelling enough edge to switch over to iOS. Similarly, iOS fans are probably not going to feel like the Pixel 2 XL offers enough improvements over the iPhone X to warrant switching teams. When we get our hands on review units, we’ll have a better idea of which phone is really the best, but there’s no doubt both will be great.